Here we provide a summary of our currently accepted payment methods, along with important instructions and how-to information for customers requiring assistance. An International Wire Transfer (also known as an International Bank Transfer) is simply a transfer of money from your bank account to ours, and can be set-up fairly easily with most bank accounts. If you have never set up an International Wire Transfer before, the first thing to do is check your bank can provide this service and how much it charges. Setting up an International Wire Transfer can sometimes be done using your internet banking account, however many banks only provide this service over the telephone or in person at a bank branch. You will need to provide the Payee/Beneficiary details we included in your order confirmation email, the amount in USD to transfer, a reference, and the account which will pay transfer fee(s) incurred. Enter our bank details exactly as provided in your order confirmation email. Provide your Order No. ID as a reference for the transfer. Ensure the sender pays all fees incurred by the transfer. International wire Transfers can take 3-5 business days to complete. Once we receive the transfer we will approve your order for dispatch. As soon as your order is on its way to you we will then send you an email confirmation with your tracking number. Please note - We are unable to accept transfers using Western Union. Please use your local bank to complete the wire transfer. Your order will be placed on hold for 10 days until we receive your payment. We cannot guarantee the item will remain available after this period. Please contact us by e-mail and we will do our best to accommodate your request. A Cashier's Check (also known as a Bank Draft or Money Order) can be easily obtained from your bank. They are almost the same as Personal Checks, except your bank will debit the amount from your account immediately and not when we cash the check. As a result it is the bank that is liable for paying us when the check is cashed. This means we ship your order as soon as we receive the check, and there is also no risk of checks bouncing and any resulting charges. Visit a branch of your bank and request an International Cashier's Check. Inform the cashier it is for an International recipient. Make sure the payment amount is in US Dollars. Provide the Payee Name and Order No. ID exactly as provided. Finally, send the International Cashier's Check to us at the address we have provided by email. We very strongly advise using registered mail with tracking. We will not be liable for any International Cashier's Checks which are lost in the mail. We will dispatch your order as soon as possible, confirming by email and providing a tracking number. 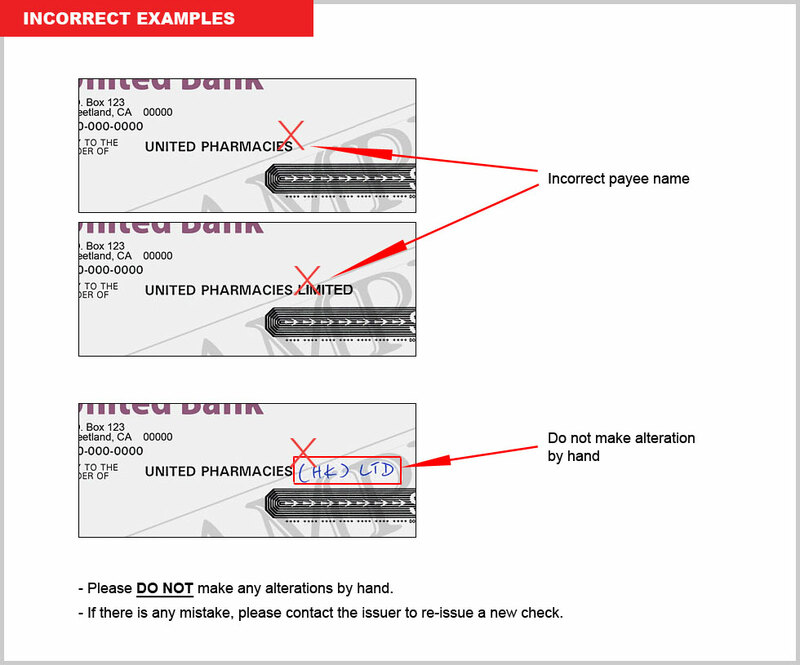 Please note - Cashier's Checks are not to be confused with Personal Checks written from your own check book. We are unable to cash Personal Checks.